On November 7, 2011 The Moderate Resolution Imaging Spectroradiometer (MODIS) flew over the Bahamas and captured the formation of Tropical Storm Sean (19L) midway between Bermuda and the Bahamas. At 18:00 UTC, the time this image was captured, 19L was still a non-tropical low and was producing gale-force winds. Clouds can be seen building over the Atlantic Ocean, and loosely forming the apostrophe-shape typical of a tropical storm. The Bahamas are located in the lower left of the image and Bermuda lies to the northeast of the storm, hidden under clouds. The storm continued to strengthen, and by 9:00 UTC on November 8, the National Hurricane Center (NHC) issued the first advisory on Subtropical Storm Sean. At that time, the storm was stationary about 445 miles (720 kilometers) southwest of Bermuda with maximum sustained winds of 45 mph (75 km/h). 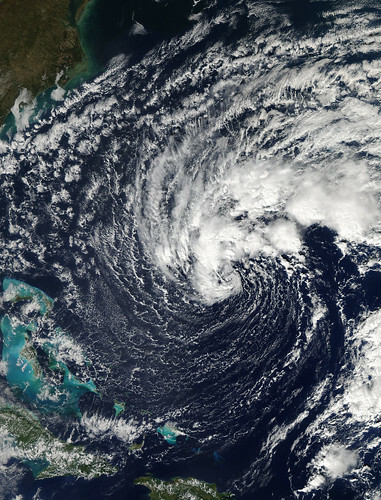 Shortly afterwards, a Tropical Storm Watch was issued for Bermuda, and by that evening, Sean had officially reached Tropical Storm status, with maximum sustained winds of about 50 mph (80 km/h). On November 9 at 3:00 UTC the National Weather service reported that the storm had changed little, and was crawling westward at 3 mph. Sean is expected to strengthen slightly by November 10, then will move into cooler waters should cause the storm to weakening, then to dissipate within the next 36 hours.